They made history and $1 billion with the first titular superhero of color in Black Panther -- now Marvel's creatives and stars are repeating the trick for gender equality. Ant-Man and the Wasp, the sequel to 2015's Ant-Man, is the 20th release in a decade from the Marvel Cinematic Universe series of comic book movies, and the first to feature a woman in the title. "We always knew that the next one was going to be Ant-Man and the Wasp," Kevin Feige, the president of Disney-owned Marvel Studios, told AFP at a global press day for the movie in Pasadena, southern California on Sunday. "It's finally time to see her suit up and be the hero that she said earlier she wanted to be." 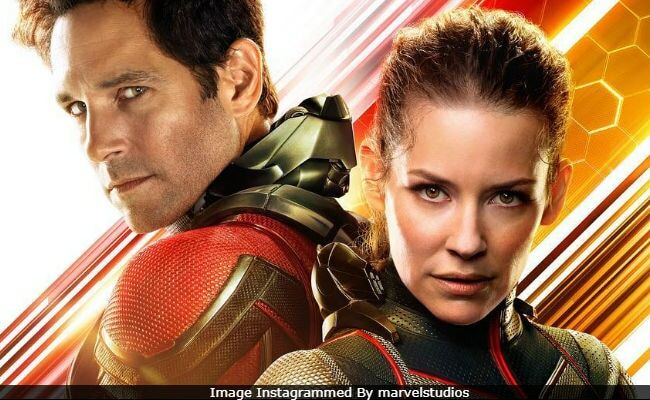 The 2015 movie featured Evangeline Lilly's Hope van Dyne as a wannabe superhero and she returns here leaner, meaner and ready to step up on an equal footing with Paul Rudd's Ant-Man. Lilly told AFP the plan was to introduce the Wasp's origin story in Marvel's 2016 release Captain America: Civil War along with Ant-Man and the other Avengers. "I got a call saying, 'We've decided not to put you in Civil War' and there was this moment, I could tell, where the feeling in the room was like, 'I'm sorry - don't be offended,'" she said. "I was like, 'Are they going to give me a movie? Is that what they're saying?' And they said, 'We really want to dedicate a film to introducing this female superhero and we don't want her just to be a side note." The surprise of double-billing came later, when Marvel sent her a screen capture with the Wasp in the title. The premise behind Ant-Man is refreshingly simple: Scott Lang, a petty criminal with lot of heart, can get very big or quantum-level small via a suit that manipulates his subatomic particles. Ant-Man and the Wasp -- directed, like the first movie, by Peyton Reed -- sees Lang languishing under house arrest in San Francisco after being caught as his superhero alter-ego fighting some of the other Avengers in Civil War. As he struggles to rebalance his home life with his responsibilities as Ant-Man, he's confronted by Van Dyne and her father, the brilliant quantum physicist Hank Pym, with an urgent new mission. That actually means very little when the competition is other Marvel movies -- it still went on to a global gross of more than $500 million. Ant-Man and the Wasp is expected to open domestically around $75 million over the weekend of July 6 -- a considerable improvement on the $57 million the first film took. "Ant-Man and the Wasp is crazy fun. Very self-contained, but brimming with energy, and full of cool and creative surprises," tweeted CinemaBlend critic Eric Eisenberg. "Super funny, and the entire cast is wonderful. I had a blast!" Rudd (Anchorman, Forgetting Sarah Marshall) and Lilly (The Hobbit: Battle of the Five Armies, Lost) are joined by an illustrious support cast, including Oscar winner Michael Douglas and nominees Michelle Pfeiffer and Laurence Fishburne. Michael Pena (The Martian, Chips) returns to provide much of the comic relief alongside Walton Goggins (Vice Principals) and Bobby Cannavale (I, Tonya). It's not just the good guys (and gals) who are inclusive; Ghost, played by British actress Hannah John-Kamen, follows Cate Blanchett (Thor Ragarnok) as a rare front-and-center supervillain. "I am the second female villain in the Marvel Universe," John-Kamen told AFP on the sidelines of the news conference. "With Ghost, it's a male character in the comics and it's designed male, but to be the first person to take it off the page and actually give her life, it was an honor." The movie -- an eye-popping blend of intricate fight sequences, stunning chases and laugh-out-loud family-friendly comedy -- was co-written by Rudd. "I try to think of the film as a whole, but I will say this: this has been a collaborative effort more than anything I've ever worked on," the typically self-effacing Rudd said. "To think I wrote it would be a gross overstatement."